1) Figure: Weight per piece various form 1kgs to 2.5kgs or even Up.It is oval-round shaped with 10-30cm of diameter. 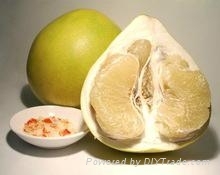 3) Flesh: Juicy, semi-transparent and nice looking. 4) Taste: Light sweet and sour. 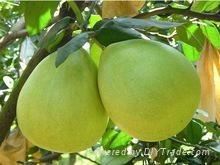 5) Function:The fruit is nutritious, with health benetifs for lungs, throat and blood circulation. 6) Packing: Individual plastic bag and mesh bag and barcode ribbon. Colored half open top carton or open top carton. .9) Safety and Quality: Our pomelos are covered with paper bagswhen they are growing. The paper bags ensure that all the pomelos come out with nice color, clean skin, and most importantly, by these bags, we control the pesticide residue to the lowest.